family arbre. . Wallpaper and background images in the Le Roi Lion club tagged: the lion king. DEUTSCH!! !sehr toll dude!i love german! Kopa is so cute. DANG MOVIE! They should just add all the lions instead of saying there is others after! 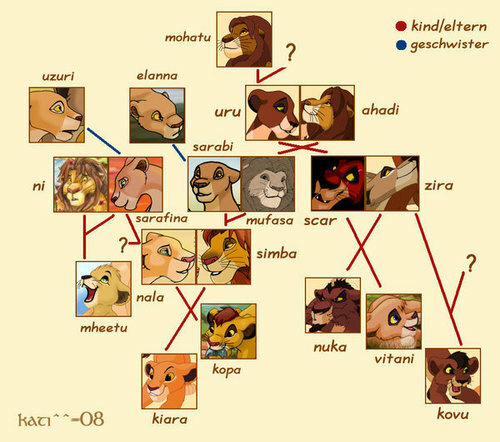 I don't think so, I think Kovu is still Zira's child just not Scar's, it wouldn't make much sense as no other lioness claimed him and there is no proof suggesting he is not her cub. Though ofc I could be mistaken so believe what you will about Kovu. Most of this isn't true. First of all, Scar has no cubs and Zira had all her children by a rouge lion. Mohatu, Ahadi, Uru and Kopa are not official and they're only profit characters that are created by outsiders who never worked with Walt Disney Co. Mheetu was written out.